For decades evolutionists have been trying to tell us the human genome was mostly filled with so-called “junk DNA”. There were two reasons for this. First, it appeared the number of proteins generated by our DNA was far less than the number that should be generated based on the amount of DNA and the average size of a protein. Second, their explanation was the junk DNA was left over from the trial and error and dead-ends of our supposed evolution. When I first heard of “junk DNA” in the early 1990’s I thought it was a bit odd. As a creation scientist, by the mid-1990’s I was making public statements that there was no such thing as junk DNA, based on my model of human origins; humans DO NOT evolve from primordial soup, but were created by God. The logical extension of that model is that most, if not all, DNA was created with a purpose. What evolutionists were calling “junk DNA” was because of ignorance, not evolution. A few years later I modified my hypothesis and stated most of the unknown DNA was the instruction set for what the body should do with the proteins after they have been made. The ENCODE project just released its results a few weeks ago and basically said the predictions of creation scientists were correct. See the USA Today article. Here’s a quote from the end of the article. This entry was posted in Commentaries and tagged creation, DNA, encode, junk, project, science by Akron Fossils & Science Center. Bookmark the permalink. Most junk DNA having a purpose would neither falsify evolution nor intelligent design. I could see if you had an issue with the ill-defined term “most”, since 51% to 99% fits. I think the number will be closer to +95%, but this is irrelevant. It was a falsifiable prediction and was made when <5% of the human genome was known to have any function. The scientist cited was an independent source that said “the ENCODE results suggest that at least 80% of “junk” DNA actually plays a role in controlling other genes”." The hypothesis has to be falsifiable by the prediction, not the prediction itself be falsifiable. In other words you have to make a prediction which, if true would support or falsify your hypothesis. Otherwise you're just guessing and it's not a test of anything. "Your statement that “lots of junk DNA is really junk” is even more poorly defined than the term “most”. For example, 2% of the human genome is 60,000,000 base pairs. I would agree that qualifies for “a lot”, but in reality is a very small percentage of the total." I don't see why a specific percentage would matter either way. To my knowledge no one has experimentally established how much junk DNA is required for evolution, or even if any is absolutely necessary. "Not sure what proof you have of the presence of “deactivated genes from the ancestral past”. Taking your example of the teeth gene in chickens, is it not possible that the gene was always present but has remained inactive." Why should that be the case? Evolution clearly offers an explanation for species having the genes for traits they don't exhibit and exhibiting traits in the womb they do not have after birth (we have tails and body-wide fur before we're born btw, whales start to grow hind limbs which then recede into the body). What is the intelligent design explanation? Is it testable? "Further, if the “right” environmental pressures were to develop that gene could become activated to allow the chicken to adapt. This view fits the observations we see today with specie adaptation. Variation with limits. Deactivated genes are not junk DNA, they have a purpose, they are just not currently being put to that purpose." An interesting idea, but how can you test it? What must be true or can't be true if that is the case? And what mechanism limits adaptation? I think religious people who see evolution as being somehow subversive to their theology are thinking "x, y and z must be true about biology to protect my view of genesis, therefore x, y and z are true". But that is not science, that's a rationalization. How predictions work in science is you take your hypothesis and figure out one or more things that must be true if it is correct or cannot be true if it is correct (that you do not yet know, often because you haven’t performed some experiment or a certain observation has not yet been made) then you do your experiment or make the observation and deal with the results – you’re either right or you’re not. It’s this lay-it-on-the-line testing that gives theories that pass such scrutiny routinely their credibility. You are not doing that, you’re just saying “I predict that my hypothesis is right”, then concluding that it is because you think it is. You could do that with anything, that’s not science. If you want to do science you have to find a way to test it. But of course you can’t test it because a magic creator with unlimited powers could make life or the universe any which way, so there is nothing that can’t be true or must be true with an intelligent designer. This is not evidence of an intelligent designer, there is nothing that could possibly be incompatible with an all-powerful genie as the originator of the universe either. We wouldn’t conclude therefore that the all-powerful-genie hypothesis is valid and teach it in science classes. The term “purpose” implies a planned design. I would say rather that it does or doesn’t have a function, which does not make any assumption about it’s origins. And either way with genetic mutations being as common as they are I can’t imagine every bit of DNA has a function. There are genetic mutations from every parent to every child, all of them are useful changes? If I irradiate myself and cause more mutations they will all result in fully functional alterations? Plus there are examples of broken mechanisms like our ability to produce vitamin C. It’s a four part process and one of the parts no longer works in humans, but works in almost all mammals. But then you’d say that we have to have faith that those genes are a dormant part of god’s long-term plan. And believe that if you want, but it’s religion, not science. That prediction does not have the potential to falsify your hypothesis, and could be correct (and logically inferred) whether ID is correct or not. When einstein proposed his theory of relativity he predicted the exact angle (to several decimal points) light would bend around the sun from a star behind the sun in an upcoming eclipse, and he was right on the money. That is why people started to take his theory seriously. That it passed many more such tests is why people still take it seriously. When darwin proposed common ancestry he predicted we would find fossils of birds with separate digits in their wings (something that doesn’t exist in life today and had never been seen before). Two years later the first fossil of archeopteryx was discovered, a prehistoric dinosaur with feathered wings and five digits with claws in the wings. This and innumerable other predictions over half a dozen fields of study are why people still accept evolution (though it’s been modified somewhat from it’s original form). They didn’t just say “I predict I’m right and I am so there”. “I could see if you had an issue with the ill-defined term “most”, since 51% to 99% fits. I think the number will be closer to +95%, but this is irrelevant. It was a falsifiable prediction and was made when <5% of the human genome was known to have any function. The scientist cited was an independent source that said “the ENCODE results suggest that at least 80% of “junk” DNA actually plays a role in controlling other genes”. The hypothesis must have the potential not just to be falsified but to, if wrong, falsify your hypothesis. That is what falsifiability means. An intelligent designer could, theoretically, design life with or without junk DNA. So your prediction does not have the potential to falsify your hypothesis and is therefore not a proper test. I don't think it really matters whether it's 1% or 99%, at least as far as ID is concerned. I just don't think it's that close to 100%, what with ERVs and duplication errors being so common. Sure, but how do we test that hypothesis? "Further, if the “right” environmental pressures were to develop that gene could become activated to allow the chicken to adapt." Yup, and "junk" DNA that has no function can be modified by mutations to produce DNA that does have a function, or modify the function of existing DNA. "This view fits the observations we see today with specie adaptation. Variation with limits." The "limits" are imposed arbitrarily by people on the ID side, given enough time I don't see what mechanism would limit adaptation. If a species could change 1% I don't see why it couldn't change 5, 10, 50 etc percent, and the fact that we share so much of our DNA with other species and the patterns we see in the fossil record suggest very strongly that more or less all life has a common ancestry, and that living things have changed dramatically over time. There weren't a lot of dogs and cats in the cambrian period if you catch my drift. "Deactivated genes are not junk DNA, they have a purpose, they are just not currently being put to that purpose." I suppose it depends what you mean by junk DNA. In a zen sort of way I guess everything has a function, though as I said I would hesitate to go so far as "purpose" because that implies more than I think we can really demonstrate. My main point was the prediction from the evolutionary paradigm was incorrect, the prediction from the creation paradigm was correct. I agree with you the amount of so-called junk DNA is not as important. Why is there a genome? Where did the information come from? Those are more important questions. If you would like to explain the junk DNA from the naturalism perspective that is fine, but please do not say the evolutionary prediction is science but the creation prediction is not science. That is inconsistent. As I stated plainly, your prediction does not have the potential (right or wrong) to falsify your hypothesis and is therefore not a scientific prediction. A creator could create life with junk DNA, without junk DNA, or with mechanisms that accumulate junk DNA, such as retroviruses. 8% of our DNA is deactivated retrovirus fragments, so your 95% figure is by definition wrong. Does this prove there isn’t an intelligent designer? No, because your hypothesis was unfalsifiable to begin with. This is why it’s not science you’re doing, but random connecting of dots. Furthermore you don’t care that your 95% figure is wrong, and no amount of verified junk DNA will ever convince you there isn’t a “designer”. Am I wrong? If not, tell me what we could find in the genome that would convince you there is no god. And a lot of junk DNA is caused by duplication errors, there are many species whose genome contains many copies of their entire genome. Some amoebas have 100 times the DNA of humans, almost all of which is deactivated duplicated DNA. Is that not junk DNA? Or are amoebas 100 times as complex as humans? Does this prove that amoebas were not designed by an intelligent designer? My PREDICTION of function for all so-called “junk DNA” was a direct result of my posteriori starting point of a designer. Stated another way, the prediction is a direct logical consequence of my starting point which is based on copious amounts of empirical evidence for design we observe in both microscopic and telescopic systems. Historically, others have stated it this way, “We hold these truths to be SELF-EVIDENT . . .” Your charge of a “god of the gaps” argument is what is fallacious. “God of the gaps” suggests invoking God or the gods or magic to explain something we do not understand. My argument is the opposite of that. If there was a designer, then we should see more signs of design. We might not currently understand every function of all of our DNA, but we are in the process of determining that by controlled experiments, not a “god of the gaps”. The fact we observe function in all DNA is CONSISTENT with a DESIGNER and is not consistent with the original predictions based on macroevolutionary thinking. Your comment isn’t coherent. Predictions in science must have the potential, if wrong, to falsify the hypothesis of the person making the prediction. That is what makes them genuine tests of the hypothesis. For instance darwin predicted that we would find prehistoric bird species with a “bifurcated wing”, in other words birds with digits in their wings, because they had to have had digits at the ends of all four appendages if they evolved from four legged land animals. If these fossils were not discovered it would make common ancestry impossible. Two years later the first archaeopteryx fossil was found, and it not only had separate digits in it’s wings (something no living bird species has) but it had claws at the ends of them too. This is a valid test of the hypothesis. However predicting more “junk” DNA will have a function is not a test of your hypothesis (that life was designed by an intelligence) because it could’ve been designed and accumulated junk DNA through mutations or retroviruses or other means. We already know that lots of “junk” DNA is really junk, a huge portion of it is deactivated viruses accumulated over time. Many more are the same gene copied twice through duplication errors. And even more are de-activated genes for traits from the ancestral past of the species that the animal no longer exhibits. Yes some genes switch genes on or off or control their function, but some of those genes when switched on give species traits they don’t exhibit in nature (but logically would’ve had in the past) – like chickens with teeth growing out of their beaks. And what about my prediction is so incoherent that it cannot be falsified? A) junk DNA has no purpose or B) junk DNA has purpose. I even went further and said most DNA will be found to have a purpose. I could see if you had an issue with the ill-defined term “most”, since 51% to 99% fits. I think the number will be closer to +95%, but this is irrelevant. It was a falsifiable prediction and was made when <5% of the human genome was known to have any function. The scientist cited was an independent source that said “the ENCODE results suggest that at least 80% of “junk” DNA actually plays a role in controlling other genes”. Your statement that “lots of junk DNA is really junk” is even more poorly defined than the term “most”. For example, 2% of the human genome is 60,000,000 base pairs. I would agree that qualifies for “a lot”, but in reality is a very small percentage of the total. Not sure what proof you have of the presence of “deactivated genes from the ancestral past”. Taking your example of the teeth gene in chickens, is it not possible that the gene was always present but has remained inactive. Further, if the “right” environmental pressures were to develop that gene could become activated to allow the chicken to adapt. This view fits the observations we see today with specie adaptation. Variation with limits. 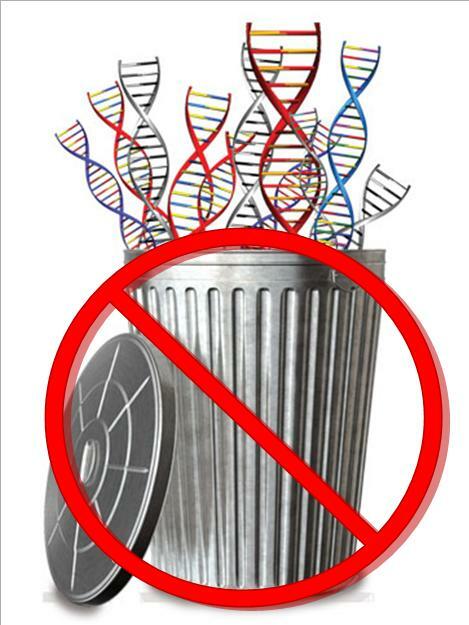 Deactivated genes are not junk DNA, they have a purpose, they are just not currently being put to that purpose. You are right that our understanding of DNA gets better daily, thanks to research carried out via the scientific method. However, your subtext – that our present incomplete understanding means any supernatural processes were involved in creation – is a “god of the gaps” fallacy.